↑ 1.0 1.1 1.2 1.3 1.4 1.5 1.6 1.7 1.8 Philbrick, Nathaniel (2006). Mayflower: A story of courage, community and war. New York: Viking. ISBN 0670037605. ↑ Merrick, Barbara Lambert (2000). William Brewster of the Mayflower and his descendants for four generations (3rd ed.). 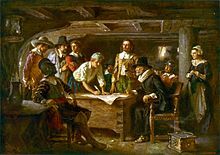 General Society of Mayflower Descendants. ↑ "A genealogical profile of William Brewster" (PDF). pdf.js. 2011. Retrieved 14 June 2013. ↑ Stratton, Eugen Aubrey (1986). Plymouth Colony: Its history and people, 1620–1691. Salt Lake City, UT: Ancestry Publishing. 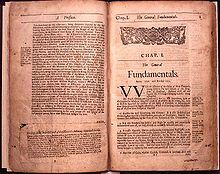 p. 413. ↑ Steele, Ashbel (1857). Chief of the Pilgrims: or the life and time of William Brewster, ruling elder of the Pilgrim company that founded New Plymouth, the parent colony of New England in 1620. J. B. Lippincott. p. 353. This page was last changed on 27 April 2018, at 02:35.